The Garlando Pro Indoor is the most advanced of the Garlando Indoor Ping Pong Tables. It features a thicker playing surface and supportive frame that work to deliver better game play. The thicker playing surface offers a firmer bounce and the thicker support system offers more rigid support that supports some rougher treatment. Though made to stand strong and steady with these features and leg levelers and wheel locks, the Garlando Pro Indoor is also constructed with mobile capacities. The wheels may unlock, the table folds in half, the detachable net may be detached and ping-pong paddles and balls may be stored. Then, the table can roll into a designated space for safe and simple storage. 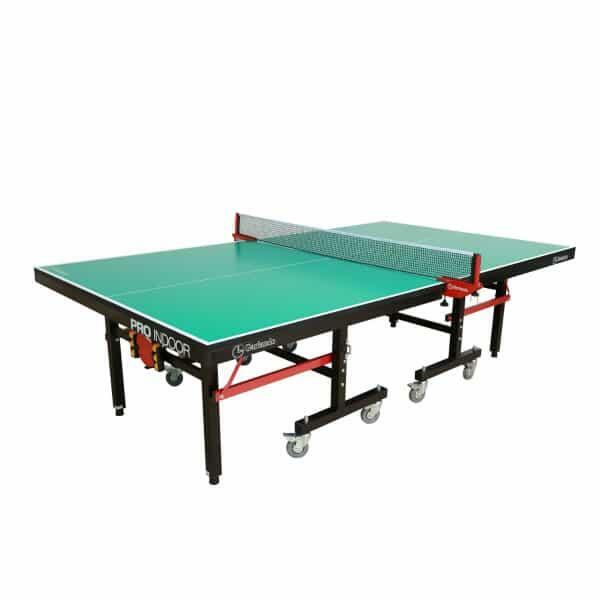 The thickness of table and frame are the real shining stars of the Garlando Pro Indoor Table Tennis Table. Though it may not seem like a lot, the difference is evident during a fast-paced, firm rally between competitors.